Posted February 6, 2017 in FAQ, Tips, Tags: CKD and juicing, juicing, juicing for kidney diet, low potassium juices by Kara Hansen. Juicing is a concept that has gained momentum over the past 5 to 10 years. But what is it really? By definition, it means to extract the juice from a fruit, vegetable, or both. Simple enough. Ok, so how do you juice? Well, there are numerous juicing appliances on the market today, each with its own features. There are juicers used by hand, and there are juicers that are referred to as cold pressed and high speed….ok, it’s getting a little complicated. I searched the word juicing online and got over 13 million hits…whoa. Seems this juicing business just got even more complicated. How in the heck are you supposed to figure out if juicing is healthy or not? There are so many factors to consider when deciding to juice. Before you even choose the fruits and vegetables to juice, there’s figuring out which juicer to buy! There are many benefits to juicing, but there are also some downsides to it too. Probably the best argument to juice is it provides at least a daily serving or more of fruits and vegetables. A typical serving of “juice” contains 3 or more different fruits and vegetables. And many of us do not consume the recommended number of servings each day. So yes, getting your daily servings of fruits and vegetables is good. On the other hand, with most juicing machines fiber is removed. Insoluble fiber helps to keep us regular—something that is pretty important to prevent constipation and keep the gut healthy. When you look at juicing through the chronic kidney disease (CKD) lens, you see a different picture. Fruits and vegetables are a main source of potassium. Depending on the type of fruits and vegetables that are juiced, it’s very easy to drink much more potassium than is recommended for a person with CKD. Some juicing recipes contain more than 2000 mg of potassium in just one serving. Juice is also counted as fluid. Some juicing recipes have between 10 to 15 ounces per serving. If you need to limit liquids be sure to consider how much you consume from juicing. Stick with no more than 5 fruits/vegetables per serving of juice. Keep in mind that this will likely yield less than an 8 ounce serving. Juice with lower potassium fruits and vegetables. Examples include apples, berries, pineapple, carrots, celery, cucumbers and kale. For added flavor and nutrients, use fresh herbs and roots like mint, parsley and ginger. Ask your dietitian about juicing and what is best recommended for you. Kara has been a dietitian for over 11 years, spending her entire career with DaVita. She enjoys family time, cooking, soccer, hiking and traveling. Juicing is in nowadays and I see them around the web. Knowing that I have two kidney surgeries in the past, I take kidney cleansing seriously. I’ll take juice recipe on my list. Thanks for sharing. Sorry if you misunderstood. The post is not related to juice cleansing but rather how kidney patients can safely incorporate juice drinks into their diets. Juice cleansing is not recommended. This blog post can help with guidelines, but keep in mind when you juice, you are concentrating the potassium from the fruit or vegetable. A small amount of juice from the vegetables or fruit you juice can contain a lot of potassium in just 3 or 4 ounces. 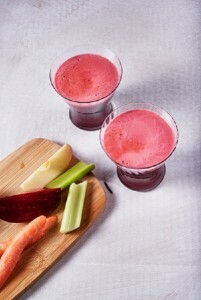 Here is a link to the beverage recipes on DaVita.com. There are several recipes that can get you started. It will be important for you and your doctor to monitor your potassium level in your blood. Unfortunately The label shown on their website does not include potassium. Most of the berries listed on the label are lower potassium berries. Because you have had high potassium levels and kidney disease please check with your doctor and dietitian before adding any supplements. They can be dangerous when kidneys are unable to remove excess minerals and other ingredients. I needed an electrolyte due to very low sodium and Dr. had me take 1/2 water to 1/2 Gatorade. I am concerned as it is still very high sugar and I am borderline diabetic. I think it’s too aggressive. I know low sodium is also very bad but my potassium was up to 5.3, also high. I see my glucose was 100 from much lower. Is there a better, safer way to increase sodium. I thought about just increasing salt in my food with such things as V-8 juice but that is also high potassium. Very confused!!! Dietary sodium can be increased by adding salt to some of your foods. Be sure to check with your doctor. Sodium can appear low in a blood test result if you have excess fluid building up in the body. Your doctor can determine the best treatment to correct the problem. If you have a doctor that prescribes Gatoraid… you should consider getting a new doctor. Many people, including doctors have misconceptions about nutrients and electrolytes in sports drinks. Your dietitian is the expert at interpreting the ingredient and nutrients in relation to your own dietary needs. I’m working with an advanced stage cancer patient whom doctors have given up on. His heart is failing so his fluids are backing up. Apparently his kidneys are unable to function properly as the circulation is compromised because of the heart problem. I introduced juicing today to try to detoxify his body, change it from acidic to alkaline. I’m concerned about his kidneys handling the excess fluids and the added potassium. What suggestion do you have in terms of which vegetables I should eliminate. I’m currently juicing Granny Smith apples celery kale cucumbers fennel ginger parsley cilantro bok choy lemons garlic turmeric red cabbage dandelions. His feet are very swolen and black and dripping. Before continuing juicing for this patient it’s important to know his potassium level. If above normal, juicing even with lower potassium fruits and vegetables can be dangerous. Juicing produces a blend that includes potassium from the produce. As a result, a serving as small as 4 to 6 ounces can contain as much potassium as 3-4 servings of produce. The DaVita Today’s Kidney Diet Juices, Smoothies and Drinks (www.davita.com/cookbook) provides recipes with potassium content and safe serving size, plus juicing concerns and tips. Hi Lydia can you please share more information about your treatment with this patient. I will really appreciate any information. Hi, I have chronic kidney disease stage 4 and I am undergoing dialysis 3 times a week. What all fruit juices can I have as there are lot of suggestions in the net and it is really confusing…please help me out..
Lower potassium juices include apple juice, grape juice or cranberry juice. The portion of the juice matters as well, typically a 4oz serving is recommended. What would you recommend to juice? I would suggest to start by adding the lower potassium fruits and vegetables as they provide fiber and will not give too much potassium. Work with the health care team when juicing as you must be aware of the patient’s potassium level and how the juicing impacts it. I am unable to guess about why your kidney function has changed. I’m glad you are seeing a nephrologist who can evaluate you and develop a treatment plan. My husband has had issues with constant diarrhea and/or incontinence and three years ago, started having severe swelling, daily vomiting and very high blood pressure. He had a seizure seven months ago and we learned his kidney function was low. He apparently had been at Stage 4 renal failure for two or more years and now is in stage 5. I’m concerned because diet has always been difficult for him, but now especially between low kidney function, high blood pressure and not being able to keep food in his stomach, I’m not sure what to feed him. I would like to juice for him but want to understands limits, nutrients, etc. He is diabetic, which I believe is what has caused all the other complications. I would appreciate some guidance. I apologize for the late response. Hopefully your husband has access to a dietitian. If he has started dialysis, there will be one in his clinic. It is difficult to give limits and nutrients guidelines unless his blood levels are known. A good place to start is with his blood results and getting his doctor and dietitians involved. My kidney functions will return somehow and anything I can do to help this I’m lookin. Cleansing in general can deprive your body of nutrients it needs. There are ways to help slow down the progression of kidney disease with diet. Here is a link to help with finding a class and information near you. Hello. I was just diagnosed with Stage 2 ckd. I’m 53 no diabetes , cvd, not over weight , very active however I do have a malfunctioning gallbladder and nafld. I just starting detox juicing 4 months ago , a 3 day detox a month per month only. I started before I knew I had ckd. Staying away from the fruits and vegetables you mention. Question is state 2 ckd something you can manage & slow down progression with diet ? Generally in stage 2 CKD, fruits and vegetables are not restricted. The progression of kidney disease can be slowed down with diet changes. Your doctor may be able to recommend a dietitian that specializes in pre-dialysis CKD diets. Here is a link to help find a kidney class new you as well. Please copy and paste into your web browser. Hi can i give a raw carrot to a CKD patient? He is candidate for dialysis. His creatinine 588.0, has high potassiumbut low in sodium. Carrots are generally safe in the CKD diet, but watching portion size makes a difference. It is a medium potassium vegetable, with a large carrot having about 230 mg of potassium. The recommendation is to start with 2500mg potassium restriction per day. If his potassium is already high, be cautious on fruits, vegetables, dairy and beans. My mother is a kidney and heart patien please recommend some diet plan for her . We provide general information, not specific dietary plans. However, you can use DaVita Diet Helper to get meal plans with menus and recipes based on your mom’s protein and potassium goals. Also, continue reading the Diet and Nutrition articles to learn more about diet for kidney patients. On major concern with juicing and stage 5 kidney disease without dialysis is potassium. It is easy to get a very high amount of potassium when juicing, even if using only low potassium fruits and vegetables. That’s why the serving sizes in the juice recipe are only 3 to 4 ounces. It’s best to know the potassium from blood test results before juicing and then work closely with the dietitian and doctor on safe amounts and frequency of juice intake.